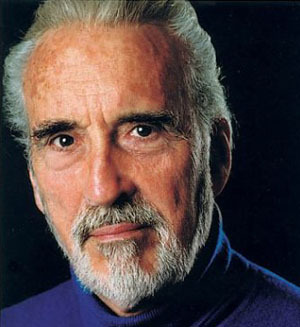 A rare example of where the term �Living Legend' can genuinely be applied, actor Christopher Lee has over 350 screen credits to his name, form Count Dracula and Hammer Horror, through James Bond's nemesis Scaramanga to Star Wars and Lord Rings. Music has always been part of his life, having turned down the opportunity to become an opera singer. His memorable role as Lord Summerisle in The Wicker Man included two songs. Mr Lee has recently recorded an album, Revelation, covering styles from Country & Western to Opera and even Heavy Metal (following on from his recording with Italian operatic metal band Rhapsody). In the week he celebrates his 85 birthday and 60 years in acting, Lee took a break to from filming his latest (yet to be announced) film to perform a few tracks from the CD and forthcoming DVD (both on Magic Entertainment) at the MCM Expo in London, with progressive jazz rock band db-Infusion in support. Due to time constraints the interview was shared with John Hill from The Wharf, an East London local newspaper. JG: Good Afternoon. Must say I enjoyed the music. The parts that didn't go wrong. At least I can say I didn't go wrong. JG: The soundcheck sounded good though. I only had one rehearsal with the band and I didn't realise to be honest how loud it was going to be and how close I would have to be to the mic, and how powerfully I would have to sing. Fortunately I have I loud voice. You see people don't believe, up to a point, they don't believe that somebody of my age, as an actor, can sing. It's the same with anybody else, whether it's singing, painting or playing the piano or whatever. They don't believe until they actually see it. This morning was a first for me, playing live. I understand most of the stuff you see is to playback (with backing tapes), so I am told, well that wasn't, it was live. I've not done that before. I sung the right notes, the right words, I speak the language. I sung it in French, it was written in French. Then suddenly at the end of the first verse, deathly silence. A technical matter that should never have happened, was nothing to do with me or the band. Which is very, almost unfair, very unprofessional. I am professional, the band are professional. We rehearsed once only and only in a small room, quite quietly. I step on to that stage, playing at that level, it's a first for me. Well, it's not the first time I've sung with a heavy metal group. I've sung with Rhapsody, but that was a very lyrical song and if I remember correctly it was to (some) playback, although I sung it. I still sing, even though it's playback. But this is the first time I've gone in front of an audience, live, and sung live, with a heavy metal band, a song, an aria, which is one of the toughest in music. I know without any, conceit isn't the word, well I know I got it right. The notes, the words, in French, I know I got it right. I was perfectly satisfied, as well as one is, I'm never really satisfied. But I did my part and the band did their part. The fact that at the end of the first verse there's a total silence, well it's a technical thing that should never have happened. I think people just came out of curiosity to see if I really could sing. And I'm going to sing the same aria again tomorrow and I hope it goes right next time. And then at end something happened, part of the chorus didn't come in. I have no idea why that happened, and I'm left all on my own. So not from my point of view entirely satisfactory. But I did at least show the public, which is the purpose of my being here, that I can sing. JG: How did you find singing with Rhapsody? JG: You recorded a single with them in four languages, how many can you speak? Well I spoke all four. Not fluent in any others; I can speak a little Russian, read and write a little Greek, and I used to speak a little Swedish, because I lived there, but I've forgotten most of it. It's just a case of, if you know any language and you go back there and spend time there, it all comes back. I mean, I've filmed in French, in France, in German, in Germany, in Spanish, in Spain, and in Italian, in Italy, big movies. I'm very accepted. Sometimes you're dubbed, even if you don't have an accent, they dub you. Why? Because you're not Frenchman, a German, or a Spaniard, or an Italian. Quite simple. JG: How did you get to work with db Infusion? That was all put together by Mannan here, and by my son-in-law Juan. They put it all together, it was their idea, and we made the CD, and the DVD is coming out next month. The band, for me, did the whole of the first verse 4 times, it's like doing a musical where somebody starts singing a song from another musical. I suppose if you're doing a duet, you're waiting for your bit, and they suddenly start singing something else. That's what happened this morning. It shouldn't. I'm doing it again tomorrow, and it had better be right, believe me. I hope I've got a voice. JG: All I heard was the music downstairs and that was good. You ever heard a man, I'll be 85 tomorrow, sing like that? Do you think there is one. Nor do I. I saw a television programme the other day, on the news, much older than me, some are 90, they call themselves The Zimmers. All singing together. I don't want to be unkind, but they had fun, and that's the most important thing. Whether you're singing a song, making a movie, making a record, doesn't matter what it is, have FUN. And I DID have fun this morning, except when the technical things went wrong. That wasn't funny at all, that's why I said to them, I've already sung the first verse, and I thought I don't want to hear it again, because they don't speak French, so I said look I've done the first verse, so I'll sing the second verse, and I did, and people who were taking the pictures, filming, can put it together without my comments. It's the one thing in my life really, I suppose, in show business, I've always said, when asked "What do you want to do?" my answer is always "Something I've never done before", where it's been possible to find. And that was live, that wasn't playback. Actual direct sound, but it was, you know, just the thing with the piano, then the thing at the end with all the others. JG: Did you harbour thoughts on recording an album or playing live after that? I didn't think anyone was interested. They said, you know, you're an actor. It's a kind of a, I don't know, a characteristic. "What do you mean you can sing you're a writer?" or "What do you mean you can paint you're an actor? ", or "What do you mean you run a company, you're a pianist?" It's something that happens more in this country than anywhere else. People don't seem to be able to accept that you can do more than one thing. I mean really do it. Do you think I would get up onstage and sing something like this? If I couldn't I'd make a fool of myself. Who'd want to play with me. What band would want to play with me if I couldn't sing. JG: I've seen db Infusion live before, last year, and they are a good live band. And I've heard you with Rhapsody. Oh yes, well that was a lyrical song. I wouldn't really call that song a heavy metal song. We had an orchestra, a chorus, the band and the tenor. I sang that song in four languages, I only have it in English, and as far as I know they sold the German in Germany, the Italian in Italy, presumably, otherwise what's the point of doing it? JH: The CD and DVD, is this a one off deal or will there be more in the future? I'll do more, if somebody comes up, yes. I'd be delighted to do another album, but we've got to find the songs. You know, many many years ago, David Bowie asked me if I'd do a record with him. It must be 30 years ago. But we couldn't find a song that we could both sing, we couldn't find it. I'm not just name dropping, there's this man, one of the most famous singers in the world and he asked me if we could do a record. He must have heard something, or knew I could sing or something. Tony McAuley asked me if I'd do something, we couldn't find, what we've got to do, if this goes well, so much depends on promotion, which I suppose is the reason I'm here, is to convince people "He really can, you know". We've got to find the right songs. I can think of one or two I'd like to do, already. But one or two isn't enough. And of course somebody will want a heavy metal song, somebody will want a flamenco song. One this is though, I don't sing operatically. My great grandparents ran the first opera company in Australia and singing music has been in my family all my life. I could have been an opera singer, I was offered, but I couldn't afford to live in Stockholm. So I never became a singer which is my greatest regret. However there is the other side. At 85, I would certainly not be singing, if I'd been an opera singer. But I can still do this kind of thing. JH: Is there anything you'd really like to turn your vocal chords to? Anything unusual I suppose is the answer. Anything, I don't know what there is to find. Can you think of anything that would appeal? Particularly to the young of course. JH: Are you doing this to enjoy it or to get critical acclaim or audience response? Oh Both. But I think the last one, the response of the audience. It's not just a question of selling records. It's how they react, that's the most important thing of all. Do they like it? Do they like it? Even if they didn't understand a word. They know me, and they hear me sing, and that's what I'm here for. If they like it they buy the record. Even with the technical glitches, which should never have happened. I don't understand these things, I really don't. Do you? When something's been rehearsed and rehearsed and somebody's worked themselves nearly to death, got it absolutely right, and the day comes..... It's like singing on a stage and suddenly the orchestra stops playing. JH: If you're not touring, it's not like the first date on a forty date tour. Oh I couldn't do that, I'm too old. The only person I knew, a very close friend, he still tours, in his early 70s, is Howard Keel, he's a trained singer. I'm not, I can't even read music. If you were out there, presumably you were, you heard me say that, it probably surprised people. I can't read a note. But that's my voice, I can't help that. But in this album we've got out, you couldn't say, if you listen to all music, you couldn't say that's an opera singer. Because as I said each song is a different character. It's my voice, but you wouldn't say he's an opera singer. JG: Is there anyone you would like to work with? Well Placido Domingo said he would like to make a record with me. But rather like the thing he did with John Denver, that kind of thing, it certainly wouldn't be opera. And somebody else, I forget who it was. And somebody else, I can't remember. But my son-in-law would know, because he was the one who told me. But Pacido was very interested in doing something. But he'll never find the time. And an operatic face tells me he would sing an operatic duet with me. If you are singing strictly opera, people who are going to listen, will know what you're singing about. Possibly even understand. But as they're not seeing you, an operatic recital for opera lovers is one thing, this isn't opera. It's very important this is emphasised. This is NOT an operatic song at all. I may need that kind of voice to come over that band. That was very loud, I'm not used to it. You hear it, I had never heard it. When we rehearsed it was never as loud as that. JH: Do you find music therapeutic, do you have it on in the background? Is it challenging? Yes, everything should be a challenge. Certainly in my world. You know, you see someone who dances, they make it seem so easy. You hear somebody sing a song, or play the piano or play the violin or whatever that might be, you think I could do that it's so easy. They challenge themselves every day to get that way, all the time. You see some of these paintings, notably by people like Jackson Pollock, who of course is one of the most famous modern painters, he's dead now, you look at these pictures and think I could do that. They all look as if, I'm told he rode a bicycle across one painting, you think you could do that, there must have been something else at work there. And Picasso, his early work I thought was absolutely superb, his blue period and so on, was totally recognisable. When he goes into that distortion of everything, I didn't really like it very much, it's like Bacon. It's distortion in his mind, but it's brilliant painting, intellectual painting as much as anything else. Spiritually, and that's something I wouldn't mind singing, could be spiritual, I could do that. Certainly would not sing "Old Man River", that's been sung to death. But I could sing "Way Down The Swanny River", or maybe "Old Black Joe", I don't know. You have to be very careful because this question of colour, things like that, can be tricky. Sadly, sadly, it's a strange world for me, my age, it's not the world I was brought up in. JH: Do you still get nervous before a performance? Yes, oh yes, it goes back to what we were saying earlier, everything must be a challenge. Everything. It's like shooting a film, which I'm doing at the moment. If you just wander on there, or when I went on stage earlier, you think I wasn't nervous? Of course I was nervous. Some of the greatest actors in the world, they're in the wings, before their first entrance, and they're nervous as hell. It's called stage fright, but it drives you.